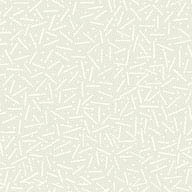 The Washington, DC area International Buddhist Committee is an interdenominational collection of local Buddhist organizations coming together to organize and promote events of interest to the entire Buddhist community. 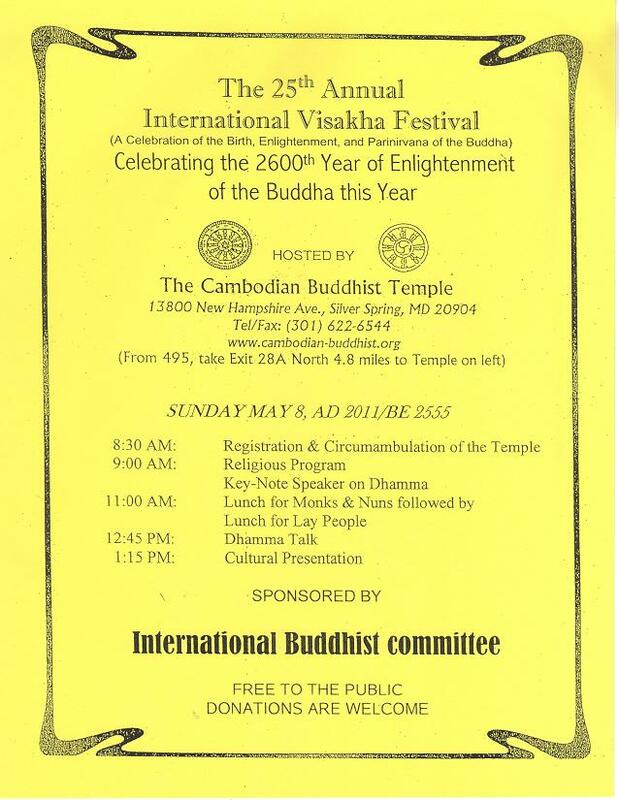 Since 1986, IBC member temples have hosted a yearly International Vesak Festival celebrating the Buddha's birth, enlightenment, and parinirvana (passing beyond). 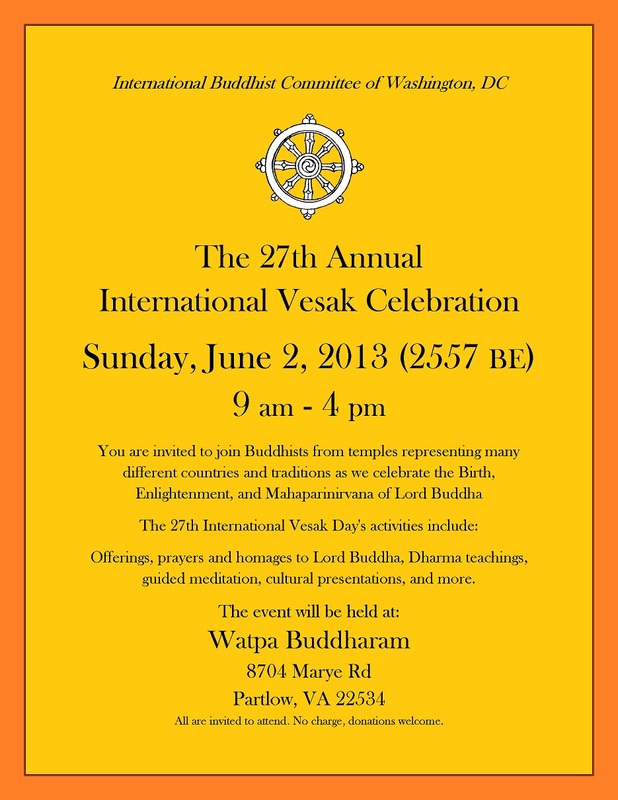 On May 13th 2012 The Washington Buddhist Vihara will be celebrating VESAK, to commemorate the Birth, the Enlightenment and the Passing away of the Buddha. This is undoubtedly the most sacred day of the Buddhist calendar. 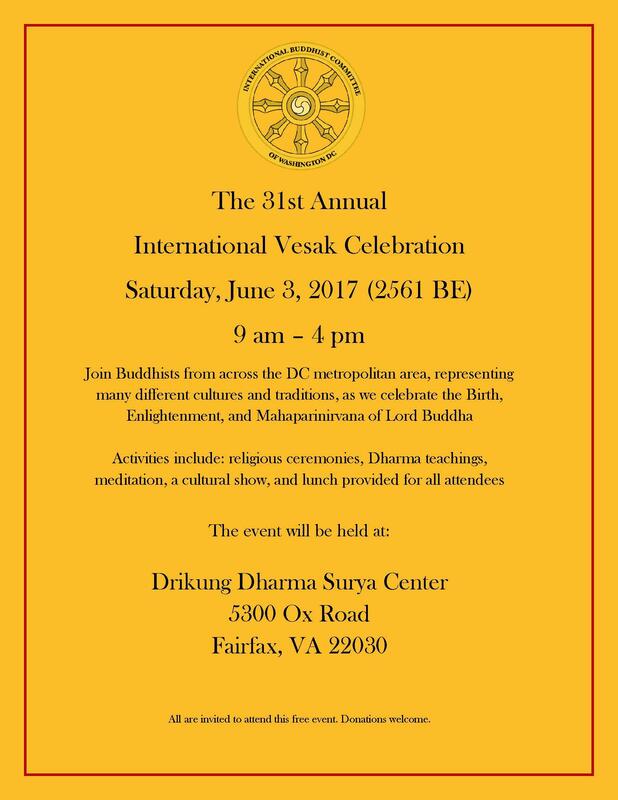 The Washington Buddhist Vihara and the IBC ( The International Buddhist Committee of Greater Washington Area) have put together a very stimulating program that would enrich the lives of all participants. Please come and experience the spiritual bliss at the Vihara and pay your greatest homage to the Buddha. Obseving 8 precepts will start at 8 am. 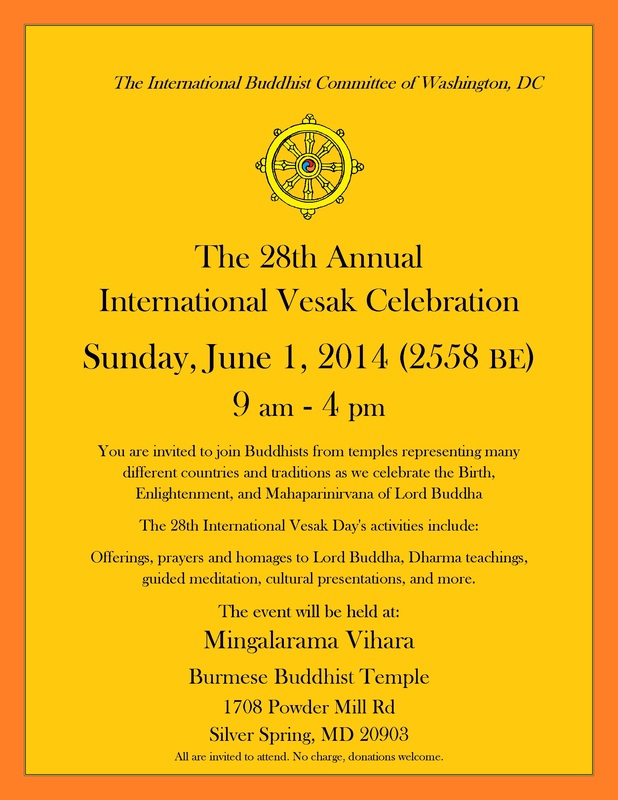 Friends, who like to participate in the International Vesak Celebration, please be at the Vihara by 9 am. A colorful VESAK procession going around the block will start by 9 am. Please bringyour kids with bicycles or tricycles decorated with flowers and Buddhist flags and so on to participate in the procession. 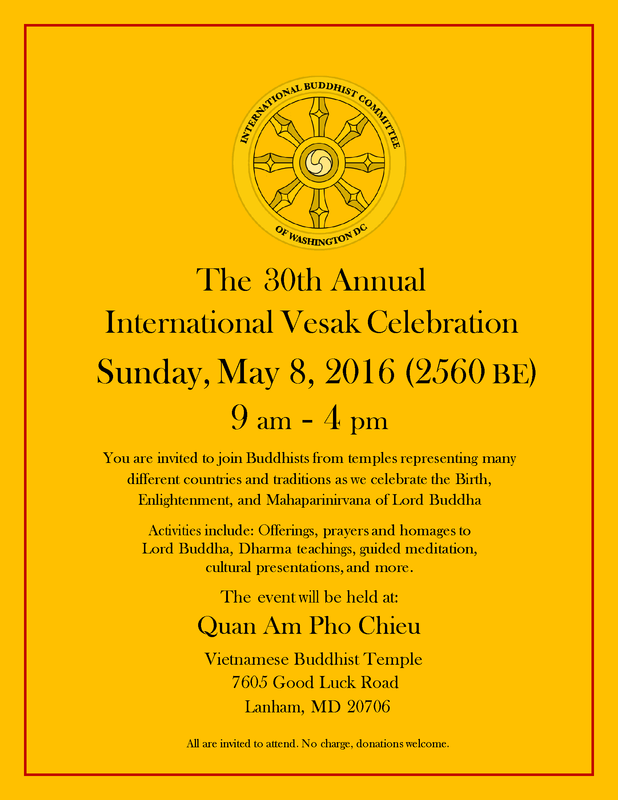 3:45 PM Closing Ceremony of the International VESAK. Up to 3.45 PM The program will be conducted in English. * 5.30 PM The End. Please come to the temple to participate in this noble deed. 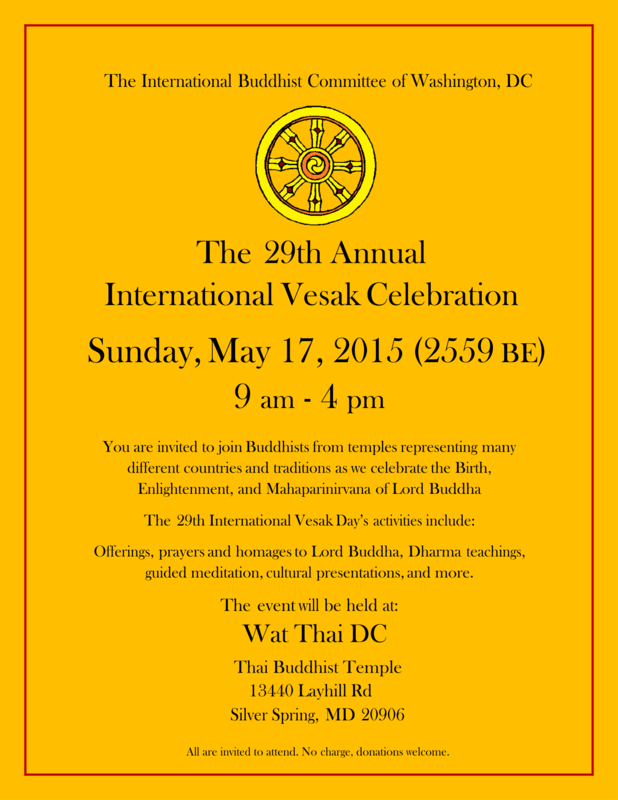 International Buddhist Committee of Washington, D.C.
You are invited to join Buddhists from temples representing many different countries and traditions as we celebrate the Birth, Enlightenment and Mahaparinirvana of Lord Buddha. Dharma teachings, meditation, cultural presentations and more. Free to the public- donations are welcome. The Washington Buddhist Vihara will be on the left near the intersection of Gallatin Street and 16th Street. Saturday, May 23, 2009/2553 B.E. No charge- Free Parking – donations welcome. Join Buddhists from temples of many cultures and traditions as we celebrate the Birth, Enlightenment and Mahaparinirvana of Lord Buddha. Offerings and circumambulations, prayers and homages to Buddha, guided meditations and talks given by Buddhist teachers from around the Washington, DC area, and food offerings by members of the participating communities. Join Buddhists from temples representing over 10 different countries as we celebrate the Birth, Enlightenment and Mahaparinirvana of Lord Buddha. 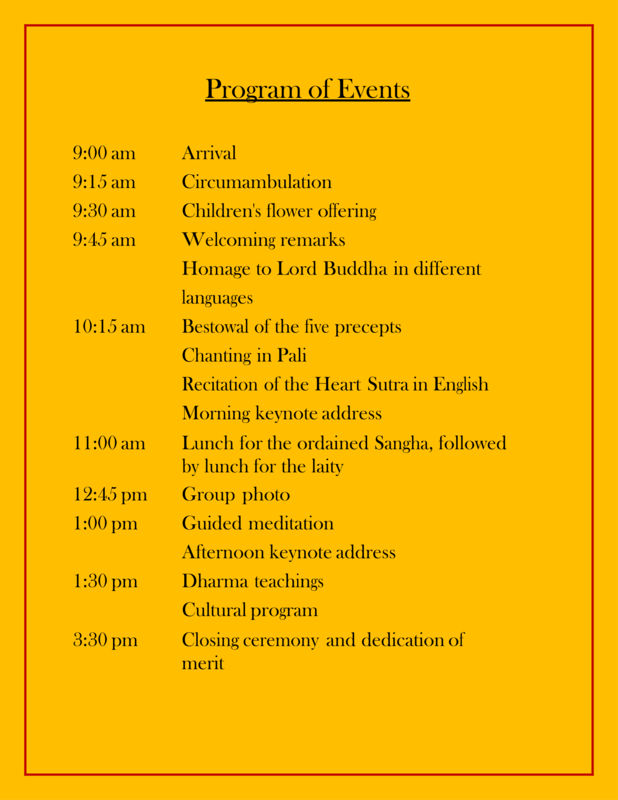 Offerings and circumambulations, prayers and homages to Lord Buddha, guided meditations given by Buddhist teachers from around the Washington, DC area, and cultural offerings by members of the participating communities. American University is located on Ward Circle, at the intersection of Massachusetts and Nebraska Avenues, NW, in Washington, DC. From northeast of Washington (New York, Philadelphia, Baltimore), follow Interstate 95 south to Interstate 495 west toward Silver Spring. See from Interstate 495 (Capital Beltway). From south or west of Washington (Norfolk, Richmond, Charlottsville) follow interstate 95 north or Interstate 66 east to Interstate 495, the Capital Beltway. Follow Interstate 495 north. See from Interstate 495 (Capital Beltway). From northwest of Washington (western Pennsylvania, western Maryland), follow Interstate 270 south. Where Interstate 270 divides, follow the right-hand branch toward norther Virginia (not towards Washington). Merge with Interstate 495, the Capital Beltway, and soon afterwards take exit 39, River Road. See from Interstate 495 (Capital Beltway). From Interstate 495 (Capital Beltway), take exit 39 and carefully follow the signs for River Road (Maryland Route 190) east toward Washington. Continue east on River Road to the fifth traffic light. Turn right onto Goldsboro Road (Maryland Route 614). At the first traffic light, turn left onto Massachusetts Avenue (Maryland Route 396). Continue on Massachusetts Avenue for about two miles, through the first traffic circle (Westmoreland Circle). About on mile further on, enter a second traffic circle (Ward Circle). Take the first right turn out of the circle, onto Nebraska Avenue. The campus is on your right. From Nebraska Avenue, you may enter the university's visitor parking lot by turning left at the first traffic light onto New Mexico Avenue and then left into the parking lot adjacent to the Metropolitan Memorial United Methodist Church. Or you may drive directly onto the campus by driving past the first traffic light on Nebraska Avenue and turning right at the first gate. Very shortly, you will see a campus map on the right. It will direct you to the The Admissions Welcome Center, located in Centennial Hall. From Union Station, National Airport or downtown Washington: Washington's Metrorail opens 5:30 a.m. weekdays and 8:00 a.m. weekends. It closes at midnight Sunday to Thursday. On Friday and Saturday nights, it stays open until 2:00 a.m.The closest Metro stop to American University is Tenleytown/AU (also called Tenley Circle) on the Red Line. Metro buses run regularly from Tenley Circle to American's campus, less than a mile away. Metro can give you information on specific route and timetables for buses and trains. Call its information service at (202) 637-7000, or you can contact the Admissions Office for a free AU shuttle pass and schedule information for AU's campus shuttle. Offerings and circumambulations, prayers and homages to Lord Buddha, workshops, Dharma lectures and guided meditations given by Buddhist teachers from around the Washington, DC area, and cultural offerings by members of the participating communities. 5017 16 th Street, NW D.C.
Take the MD-97 S / GEORGIA AVE exit- EXIT 31B- toward SILVER SPRING. Turn SLIGHT RIGHT onto MD-97 / GEORGIA AVE (0.3 miles). Turn SLIGHT RIGHT onto 16TH ST / MD-390 S, and follow 16TH ST NW (4.0 miles). The Washington D.C. Buddhist Vihara will be on the left.